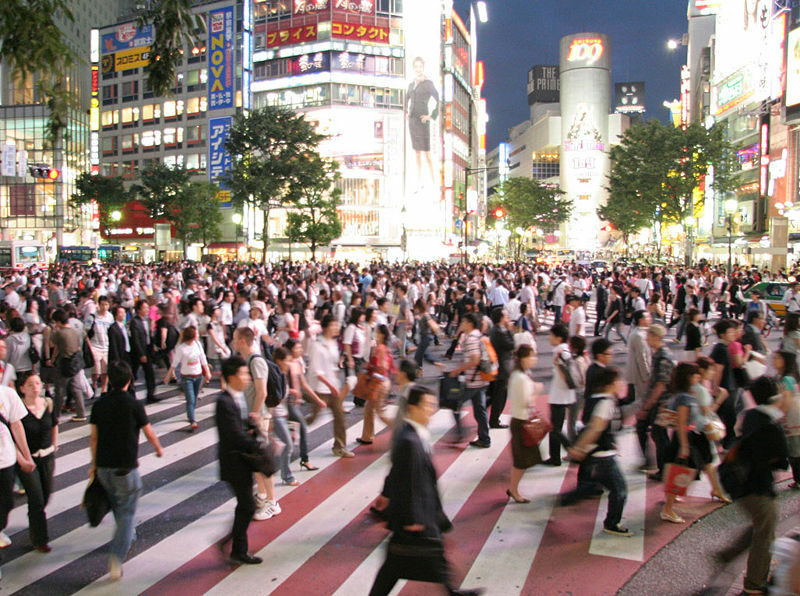 If you were to ask people to describe "Japan" or "the Japanese" in one word, there's a pretty good chance that you'd hear one word over and over again: "homogeneous." The Japanese have long prided themselves on the homogeneity of their nation, and it sure is easy to believe that is the case, but the truth rarely lies on the surface. In reality, Japan, like any other nation, is an ocean of diversity, home to multiple minority groups. One of these groups is Japan's indigenous people, or the Ainu. Don't be surprised if you haven't heard of the Ainu. In fact, many Japanese themselves are unaware of the existence of their own country's indigenous people. But why? For hundreds of years, the Ainu have been either ignored, discriminated against, or forced to assimilate with mainstream Japanese culture. Obviously, none of these circumstances are favorable for propagating cultural stability or awareness. And unfortunately, this has led the Ainu language and culture to the brink of extinction. However, with the government's (long awaited) official recognition of the Ainu as Japan's indigenous people in 2008, it appears that there has been a revival of Ainu pride among the few Ainu that remain, as they desperately try to preserve what culture they have left. Here, I hope to outline some of the most important aspects of the Ainu language and briefly touch upon the culture in hopes to bring light to one facet of Japan's diversity. The Ainu people are historically residents of parts of Hokkaido (the Northern island of Japan) the Kuril Islands, and Sakhalin. According to the government, there are currently 25,000 Ainu living in Japan, but other sources claim there are up to 200,000. The origin of the Ainu people and language is, for the most part, unknown. However, there have been many theories on the subject. One theory suggests that the Ainu people are remnants of the Jomon-jin, or the hunter-gathers who inhabited Japan during the Jomon Period (14,500 BC – 300 AD) and perhaps even before. 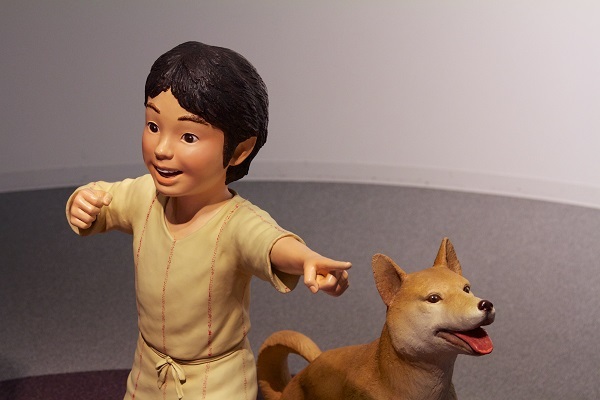 Around the year 300 AD, another group of immigrants known as the Yayoi people made their way to the islands of Japan, introducing new agricultural techniques and technology and integrating with the Jomon people. It is believed that the Yayoi group may not have reached as far as the Northern island of Hokkaido, allowing the Jomon hunter-gatherer way of life to survive in that area. One Ainu myth claims that "They lived in this place a hundred thousand years before the Children of the Sun came." It's interesting that this myth seems consistent with the theory of the Ainu descending from Jomon-jin. More recent research suggests that the historical Ainu culture could have come about through the merging of the Okhotsk culture and the Sastumon, a Jomon group very similar to the Ainu. Physically, the Ainu stand out distinctly from the Japanese as a separate ethnic group. 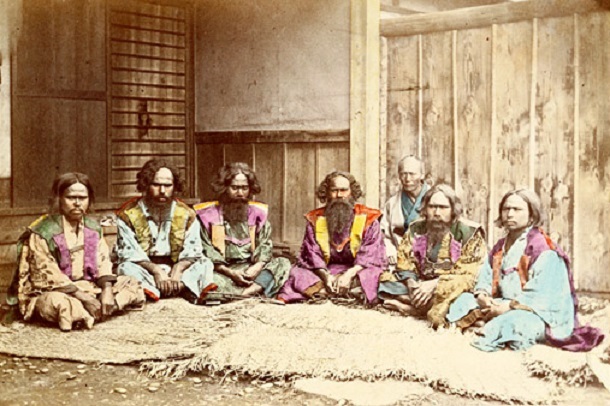 Ainu people tend to have light skin, a stout frame, deep-set eyes with a European shape, and thick, wavy hair. 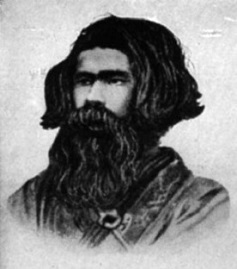 Full-blooded Ainu may have even had blue eyes or brown hair. 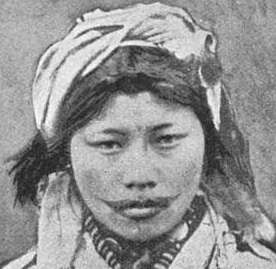 In the past, the Ainu were proposed to be of Caucasian decent, given their appearance, but recently it has been proved through dental morphology and fingerprinting that the Ainu are in fact Mongoloid, not Caucasoid. 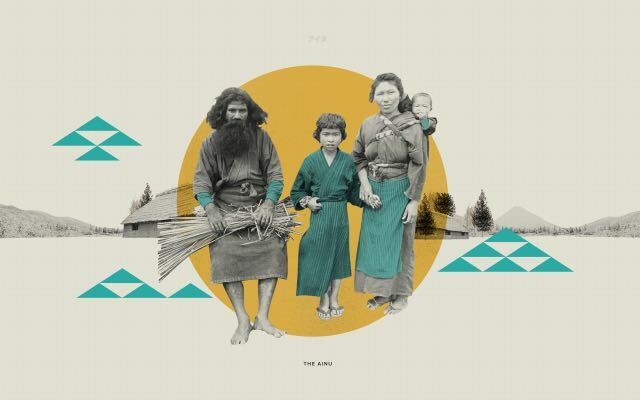 These days, the concept of a pure Ainu is very blurred. 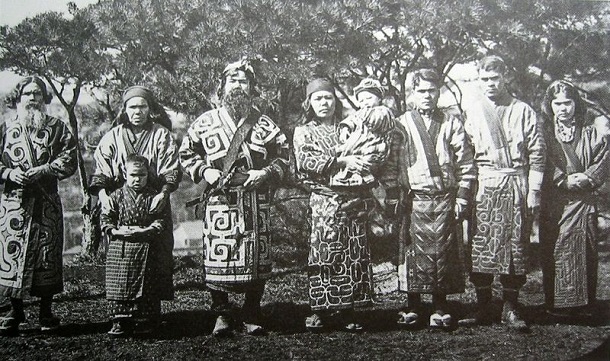 Distinguishing the Ainu from other Japanese is almost impossible due to intermarriage with the Japanese, migration, and denial of the Ainu identity to avoid discrimination. You can see just by the appearance of the Ainu that traditional Ainu culture is significantly different from Japanese culture. First of all, both men and women keep their hair at shoulder length and wear traditional Ainu garb. Men, never shaving after a certain age, usually have full beards, and women undergo mouth tattooing to signify their coming to adulthood. As hunter-gatherers, the Ainu lived off of the land. Common foods included deer, bear, rabbit, fox, salmon, root vegetables, and much more. Unlike the Japanese, the Ainu always cooked their food, never eating anything raw. Common hunting weapons included poisoned spears and bow and arrows. One way that the Ainu were similar to the Japanese is in the way of religion. The Ainu, just like the Japanese people, were animists and believed that all things are inhabited by spirits known as kamuy. While there are many gods in Ainu belief, one of the most important is known as Kim-un Kamuy, or the god of bears and the mountains. 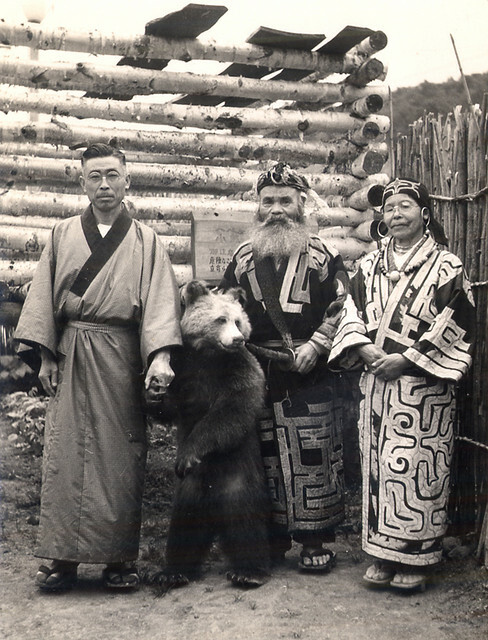 All animals are thought to be the manifestations of gods on Earth in Ainu culture, however, the bear is believed to be the head of gods and is therefore known as kamuy, or "God." Traditionally, the Ainu sacrificed bears in order to release the kamuy within them to the spirit world. One tradition, called lotame, involves the raising of a young bear cub as if it were an Ainu child and then sacrificing once it has come of age. 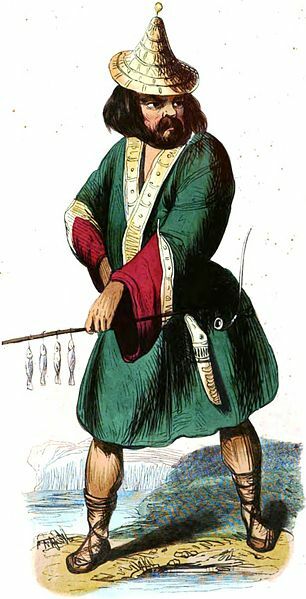 During the Tokugawa Period (1600-1868) the Ainu became increasing involved in trade with the Japanese. At this time, they were able to maintain their culture and way of life to a certain extent, although there is some evidence that the Ainu became slaves. However, the Meiji restoration brought great change to everyone in Japan, including the Ainu people in 1899. 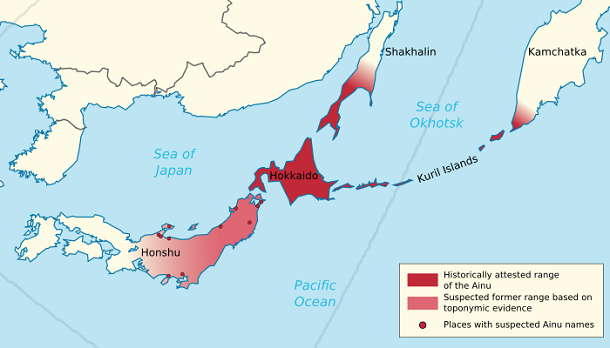 As Japan began reforming to Western standards, the government decided to unify Japan by annexing the Northern island of Hokkaido and creating a law that restricted the Ainu from participating in their own cultural activities. In other words, the Ainu people were stripped of their land, customs, and language in hopes that they would assimilate to Japanese culture. It wasn't until 1997 that this law was lifted and the Ainu people were allowed to practice their own customs again, but by that time, much of the damage was done. The indigenous language of Japan is, much like the Ainu people, of unknown origins. With the restrictions placed on the use of the language in 1899, Ainu speakers have all but disappeared. Today the language is said to have less than 15 "native" speakers, all of which are above he age of 60, making Ainu a "critically endangered" language. 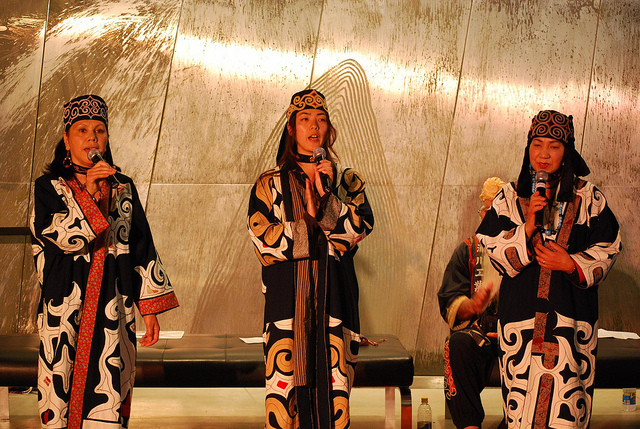 Originally, the Ainu language had three main dialects: Hokkaido, Sakhalin, and Kuril. However, the Hokkaido dialect is the only one that survives today. One interesting point about Ainu is that it does not have a written form. The language has lived by being passed down from parent to child for countless years and has historically been transcribed using Japanese kana. The lack of a writing system has of course hindered the ability of the Ainu to preserve their language after it was banned, and the use of Japanese kana has even influenced some Ainu pronunciations. Even so, the language has been able to live in the tradition of Ainu story telling, or Yukar, the language of which is mutually understood by all Ainu groups and is known as Classical Ainu. In the past, there have been many attempts to place Ainu and Japanese in the same language group, but such claims have been shot down again and again. As of now, there is no widely accepted theory regarding the relationship of Ainu to any other language and it is therefore known as a language isolate. One of the most prominent features of Ainu is the fact that it is a polysynthetic language. In other words, Ainu is a language in which main ideas are expressed through words composed of smaller word parts with individual meanings, also known as "sentence words". A basic example of this would be the Ainu word ku-pirka, meaning "I am good." A more extreme example would be the Yupik word tuntussuqatarniksaitengqiggtuq which means "He had not yet said again that he was going to hunt reindeer." Interestingly enough, the polysyntheitic nature of Ainu is very similar to the languages of many North American indigenous groups. So what does Ainu sound like? To the untrained ear, Ainu might sound a lot like Japanese. Just like Japanese, the Ainu language is an SOV (subject, object, verb) language using the five vowels a, i, u, e, and o. However, Ainu only has twelve consonants, excluding d, b, g from Japanese, and vowels are never elongated. In fact, Ainu does not differentiate between several consonants, such as b and p, and in this way it is more similar to Korean. Another way in which Ainu is significantly different from modern Japanese is that it avoids vowel sequences. In order to avoid vowels "touching," semi-vowels such as y or w are inserted between them. Sometimes vowels are even pronounced more like consonants, such as in the word Ainu where the "a" is pronounced with a glottal stop. If you want to hear recordings of the Ainu language or learn some for yourself, check out this great Ainu talking dictionary. For nearly 100 years the Ainu people lived in Japan under a policy of extinction by assimilation. They were forbidden by the Japanese government to practice Ainu customs or even speak their own language in hopes that the Ainu would vanish from the face of the planet, but did they succeed? With so few Ainu speakers left and many Ainu denying their own heritage to avoid discrimination, you might say so, but things seem to be looking up lately for Japan's indigenous people. The year 1994 marked a great turning point for the Ainu people, as the first ever Ainu, Shigeru Kayano, entered the Japanese diet. Shigeru dedicated his life to promoting the well-being and awareness of the Ainu people. It was thanks to him as well as other supporters that the law forbidding Ainu culture was lifted in 1997. Since then, government funding and cultural freedom has allowed the Ainu people to start regaining and preserving their precious way of life through Ainu language courses, radio stations, and public performances. Still more recent landmarks in Ainu history include the official recognition of the Ainu as the indigenous people of Japan in 2008 and the formation of the Ainu political party in 2012. It seems that while there is still some discrimination of the Ainu people, those who rejected their heritage before are beginning to admit it openly or even embrace their identity with pride. A great example of this is the band known as The Ainu Rebels. This band is a group of proud young Ainu who have mixed hip-hop and traditional Ainu music, and I have to say, I'm a fan. Although the Ainu culture is on the brink of extinction, it seems that more and more effort is going into bringing it back to life. These days, young Ainu such as The Ainu Rebels are doing their best to create a new identity for their people and a Japan more open to minorities. Since the depth of the Ainu culture and language can't be expressed in so few words, I recommend reading more about them or, if possible, experiencing Ainu culture for yourself.